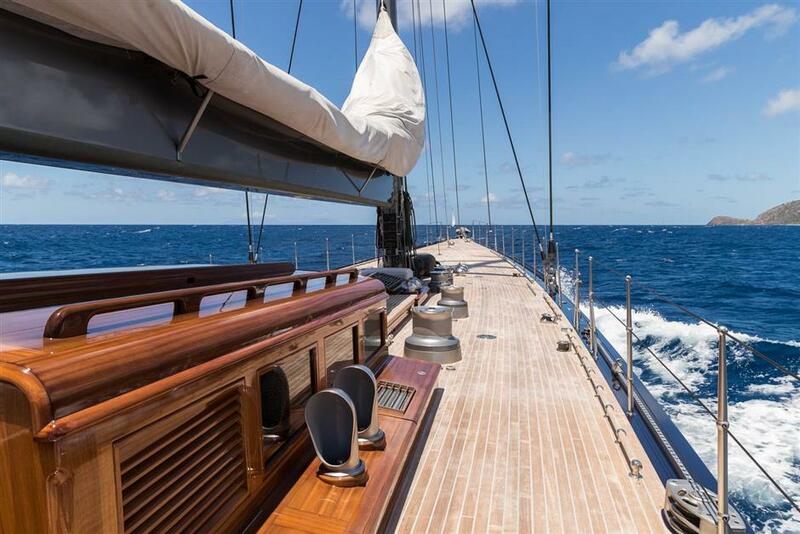 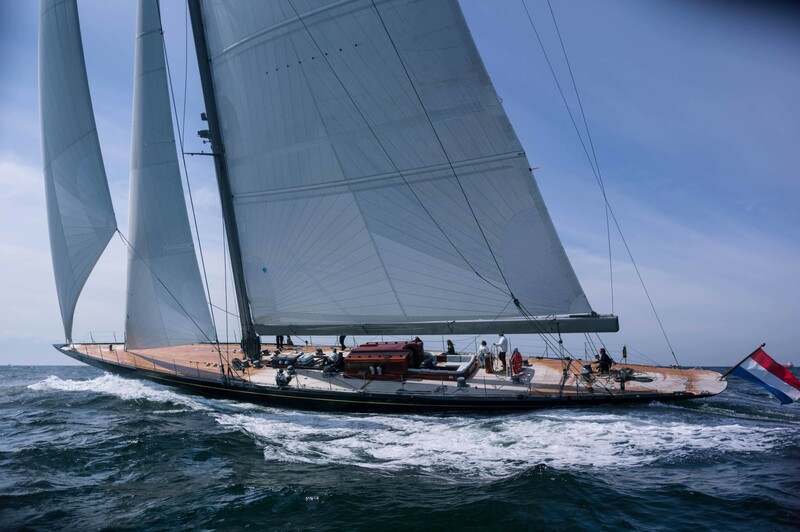 Sailing Yacht Rainbow is a 40 m J-Class yacht redesigned by Dykstra & Partners naval architect, based on the original sailing yacht by William Starling Burgess from 1934. 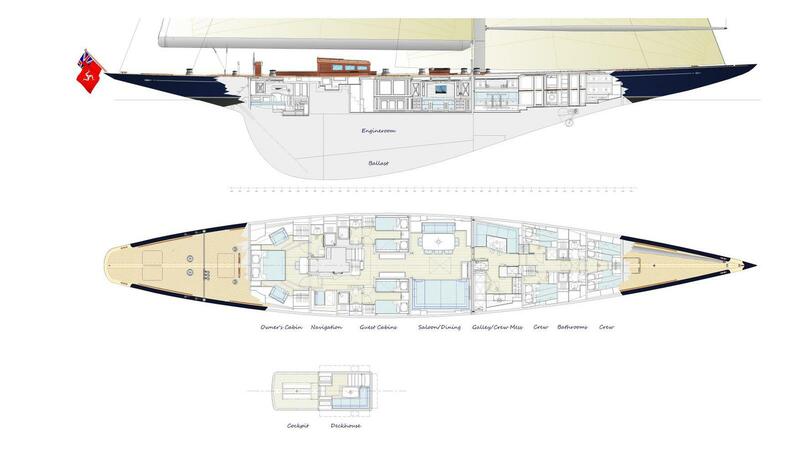 Her launch date was the end of 2011. 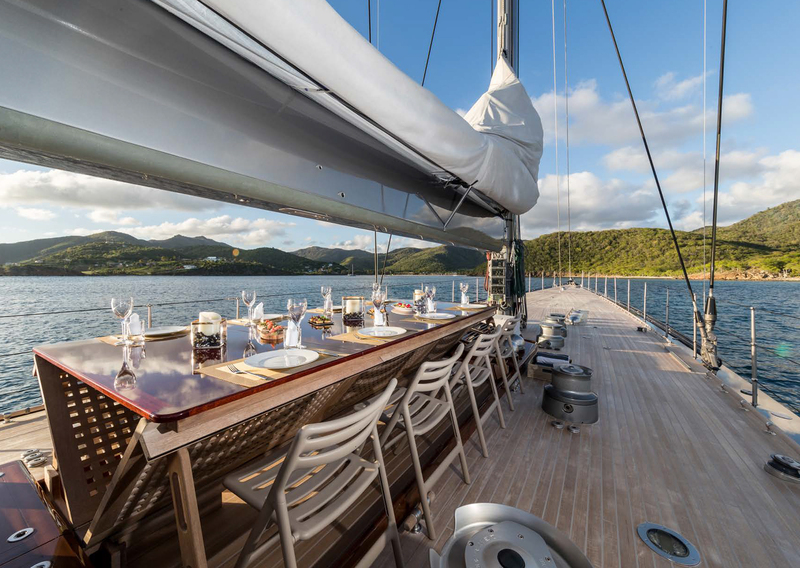 Charter yacht RAINBOW can accommodate eight charter guests. 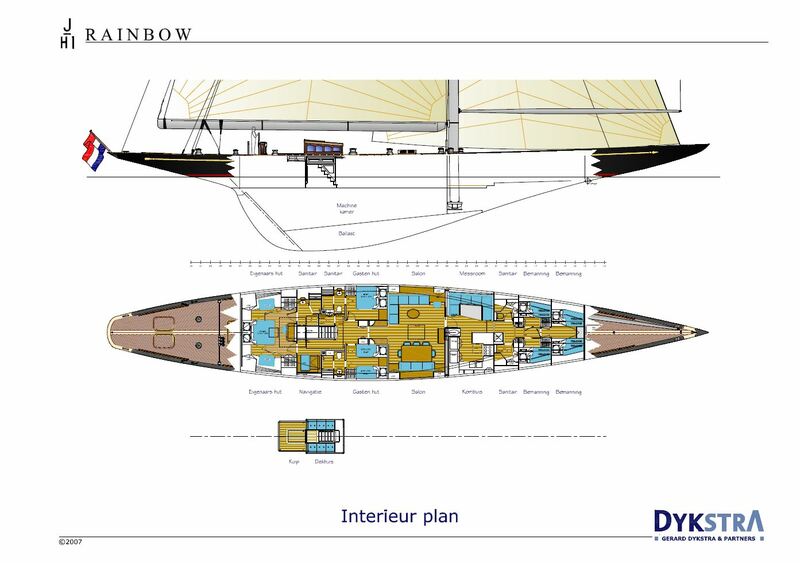 Superyacht Rainbow is built in aluminum with carbon mast and rigging with 3-DL racing sails. 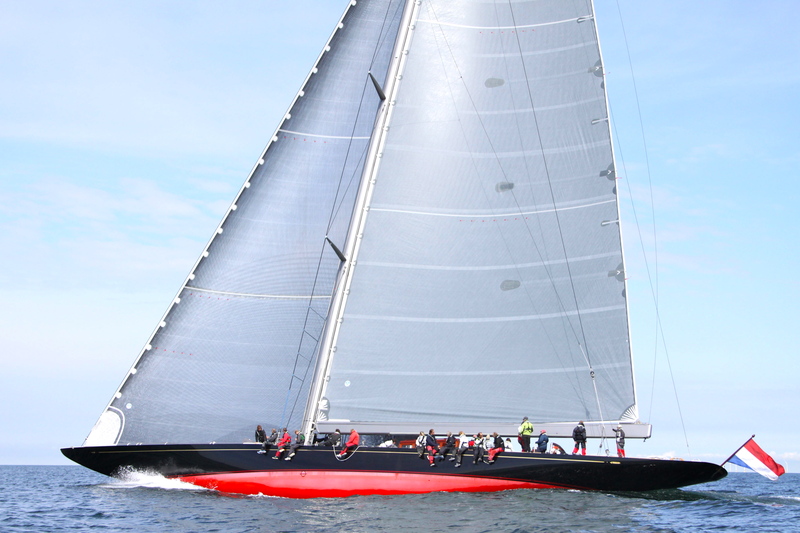 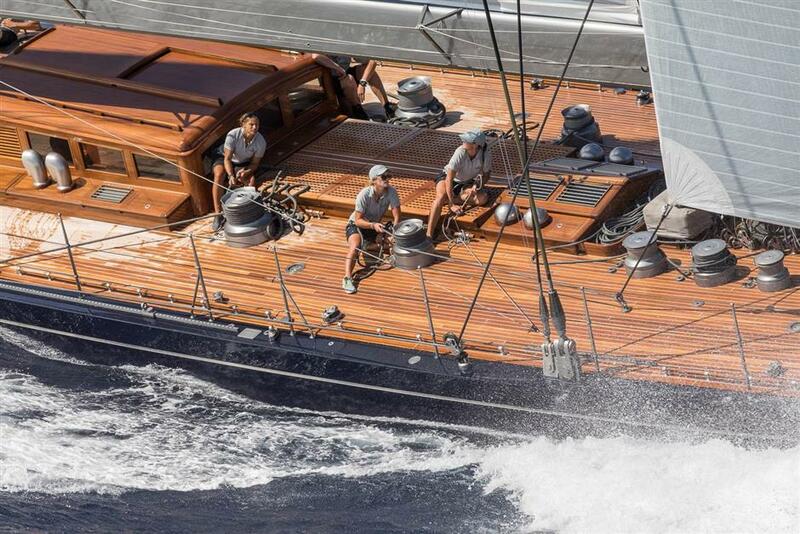 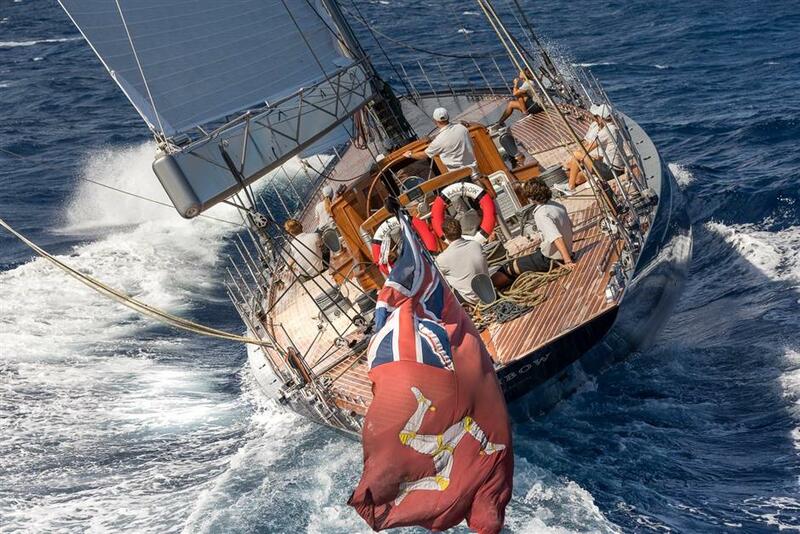 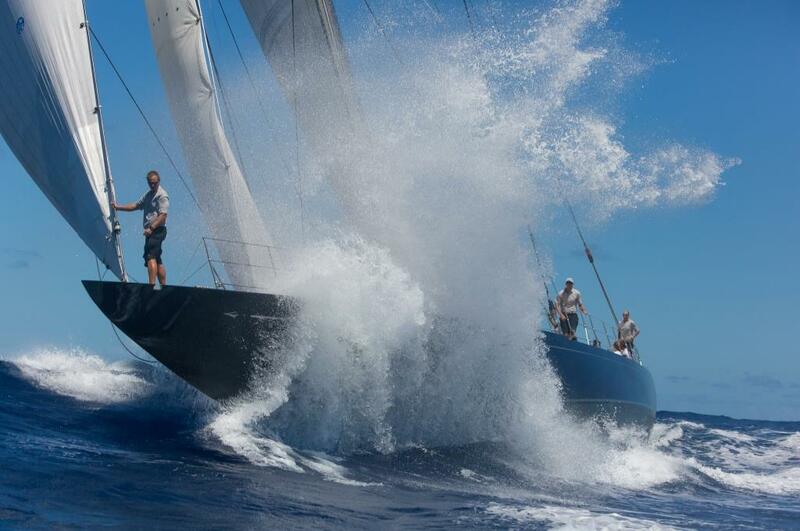 She is built and fitted for racing against the existing J-Class boats according to the J Class Association rules. 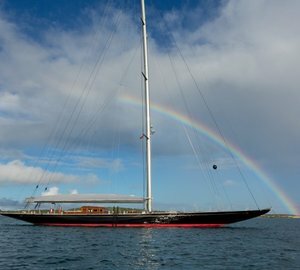 JH2 Rainbow yacht us built under Lloyds A1 and MCA to make her suitable as a charter yacht. 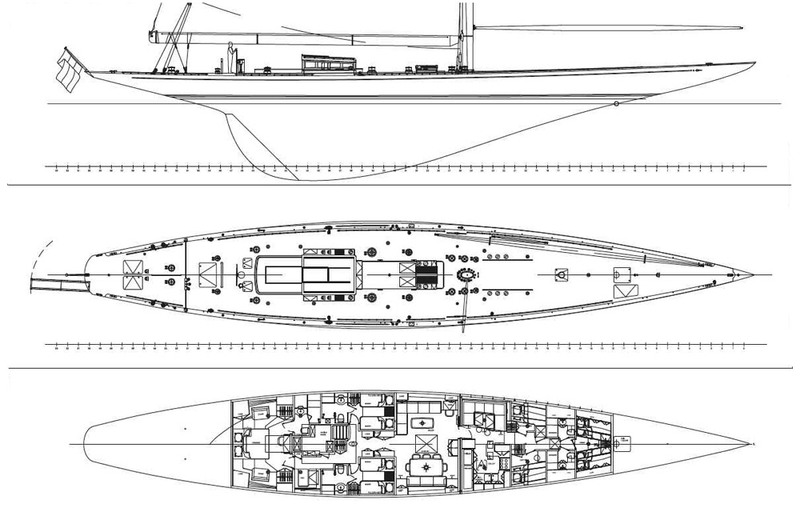 She features a diesel-propulsion system and has no main engine. 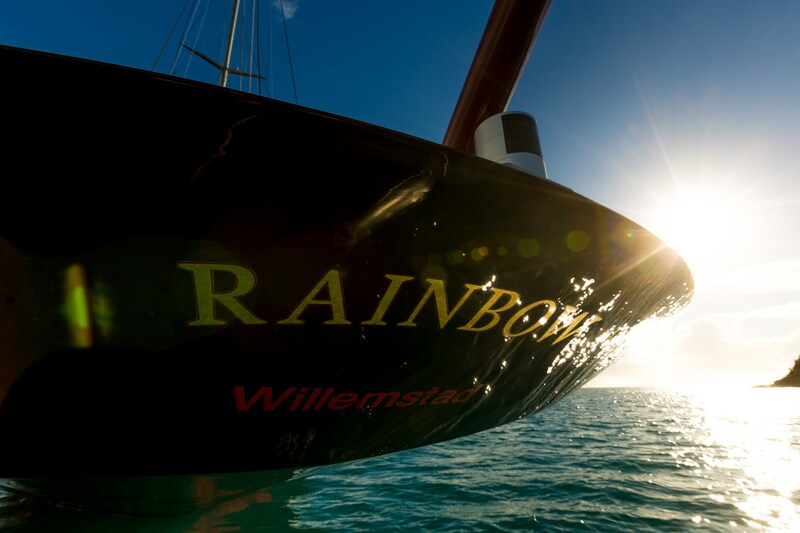 However, Rainbow sailing yacht is supplied by two generators, delivering 350kW on the propeller. 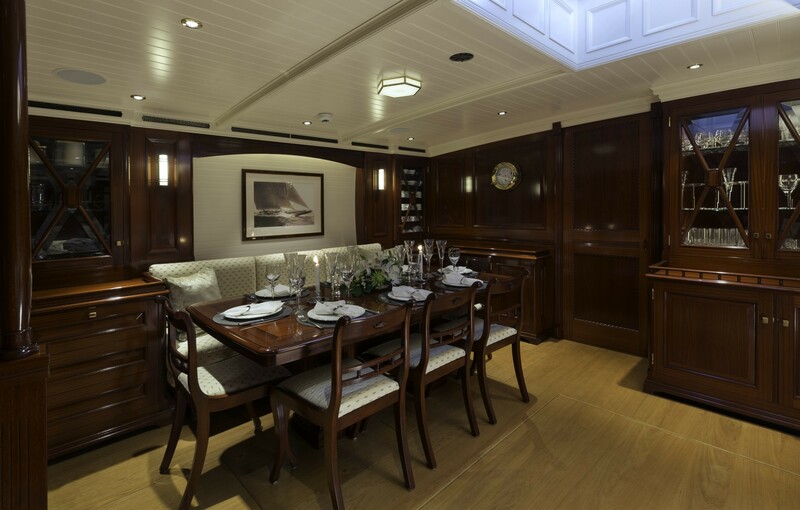 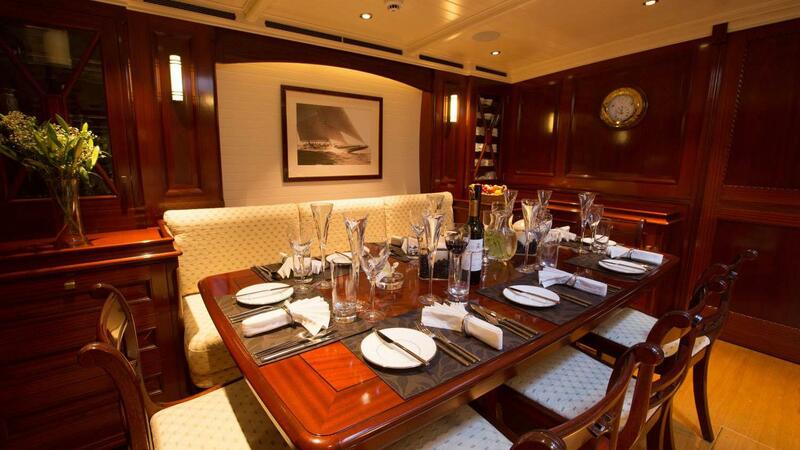 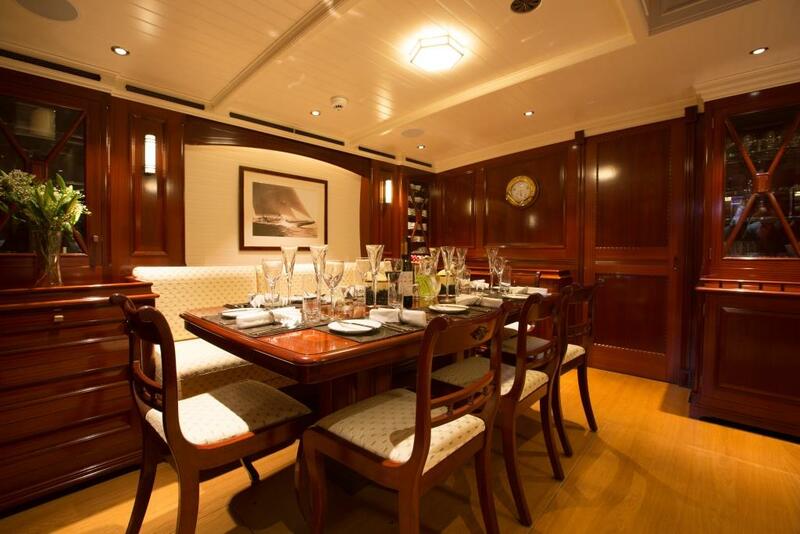 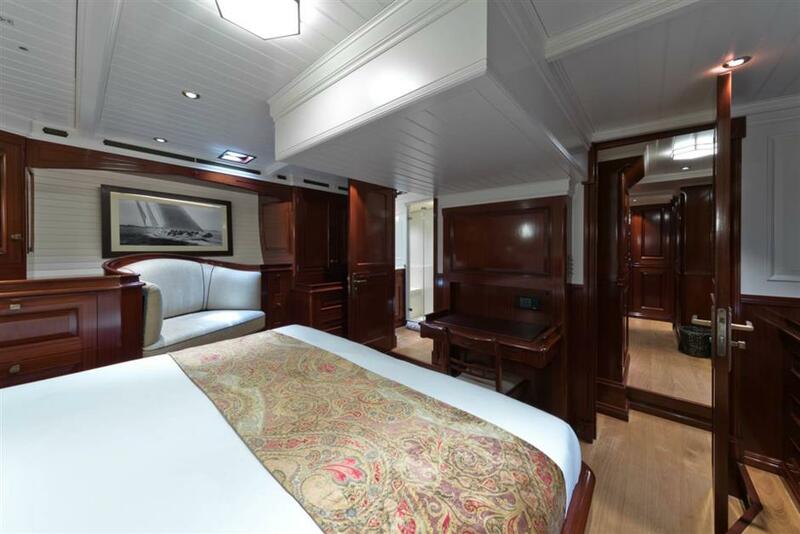 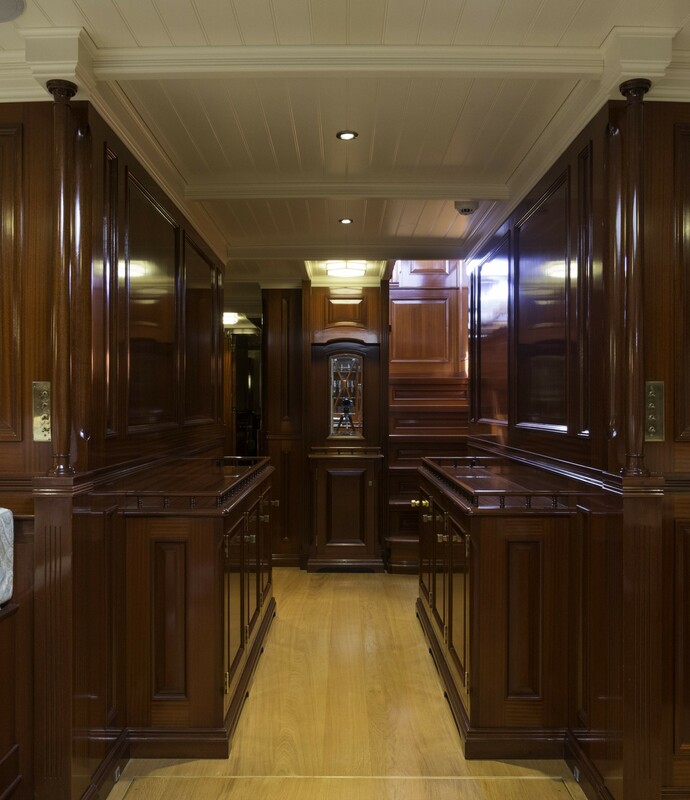 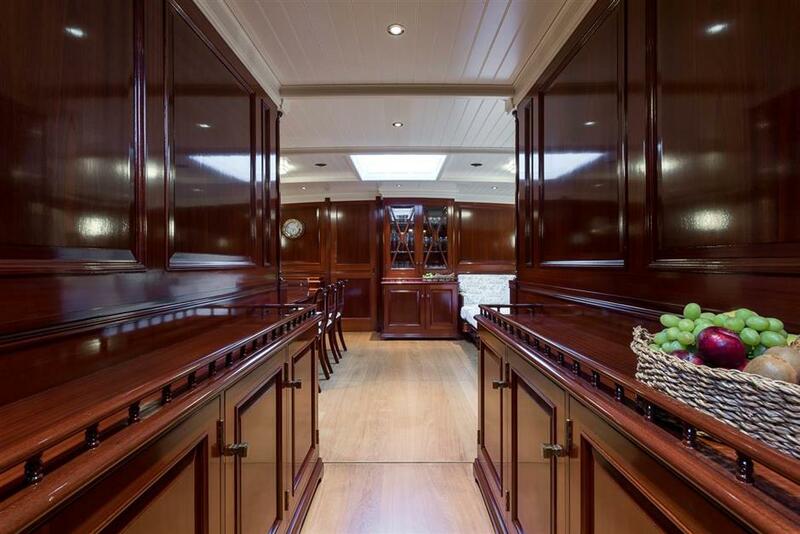 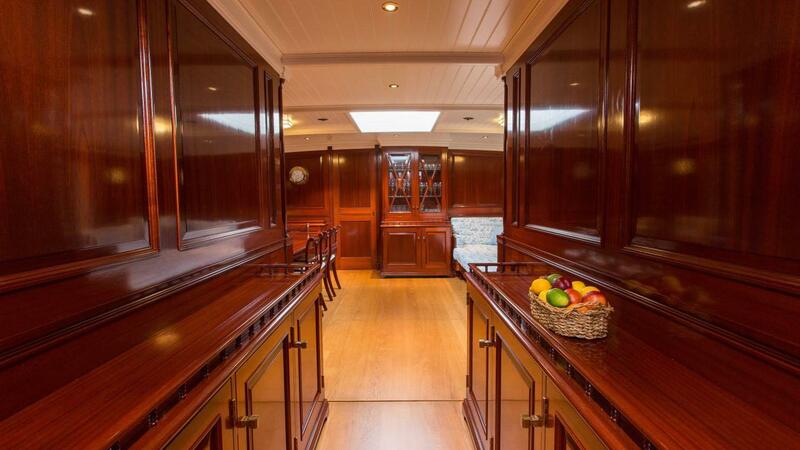 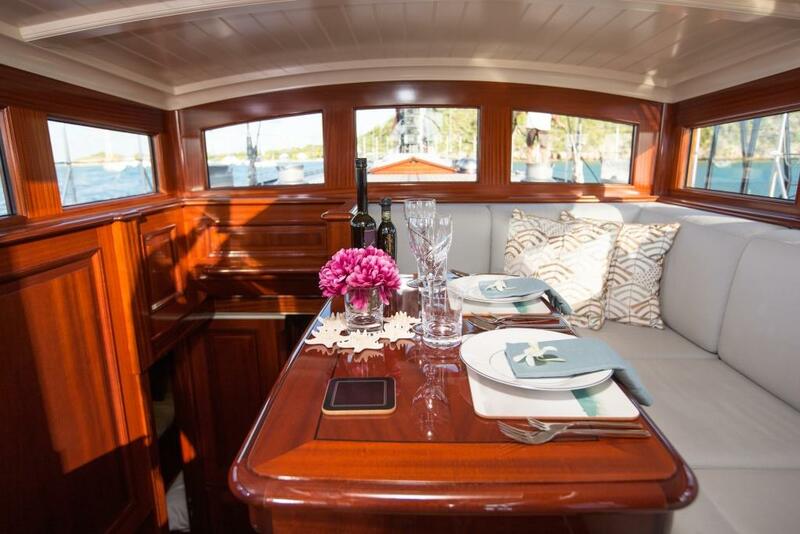 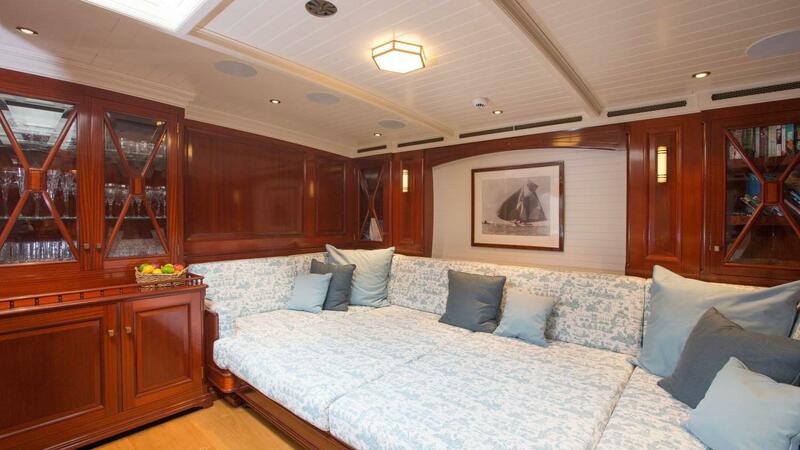 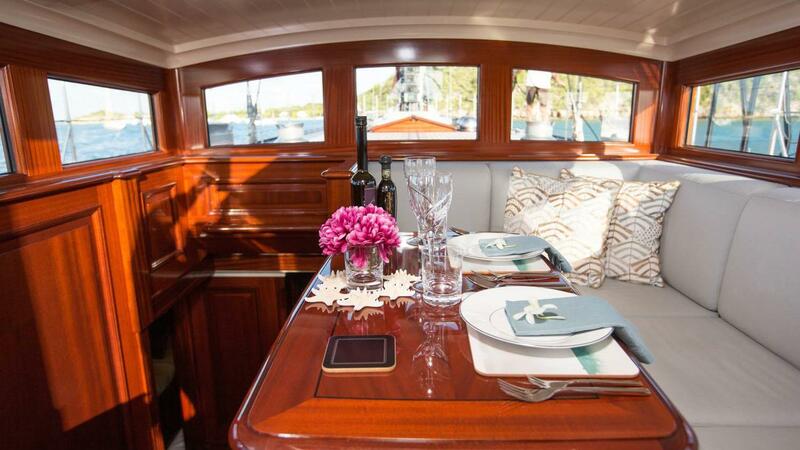 RAINBOW also boasts a high-end superyacht interior featuring raised and fielded mahogany paneling with art deco details. 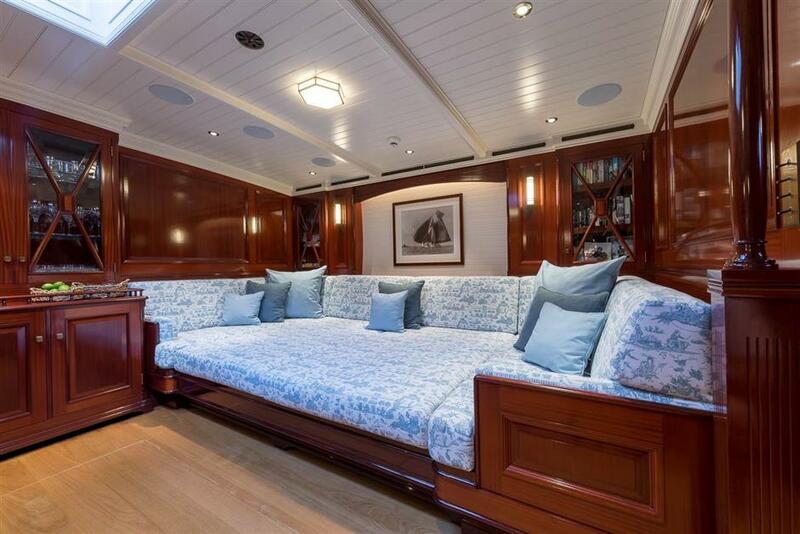 Her interior design was overseen by the Owner, with developments from Dykstra & Partners. 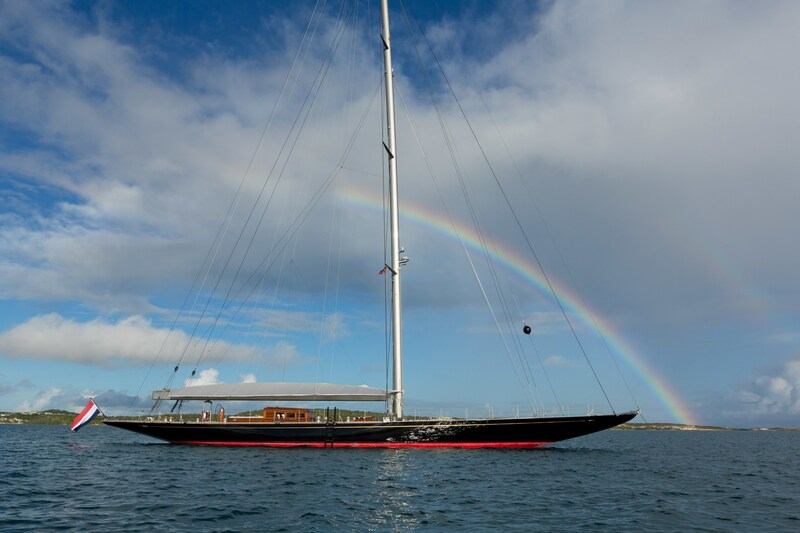 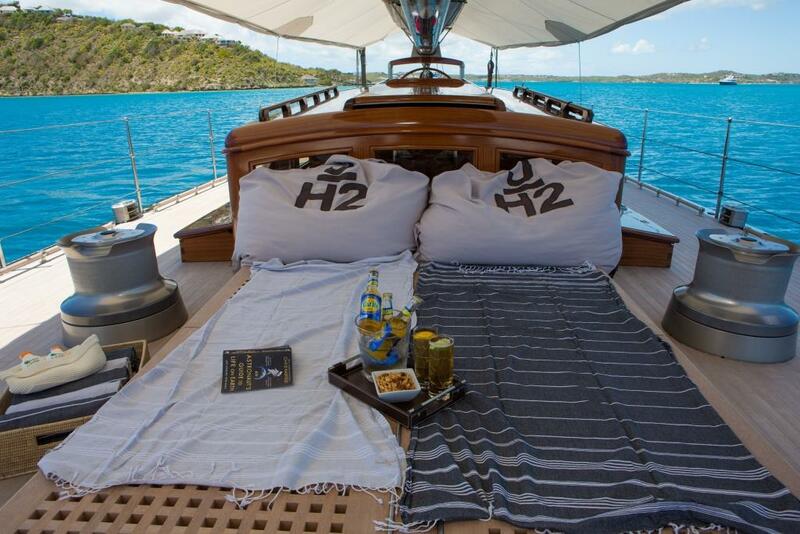 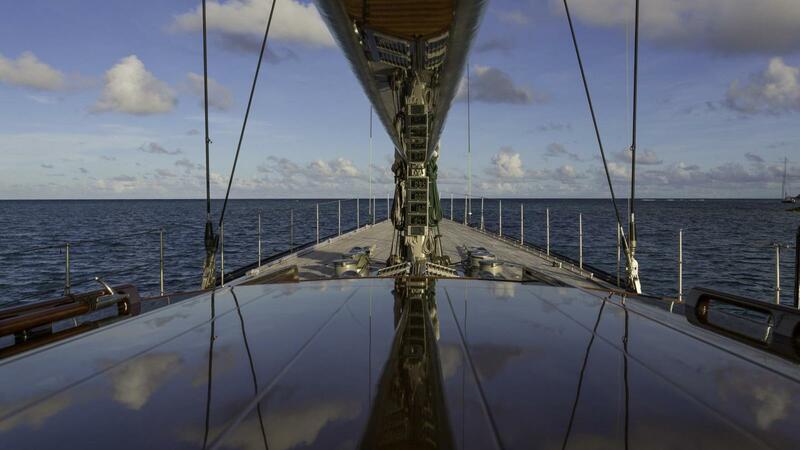 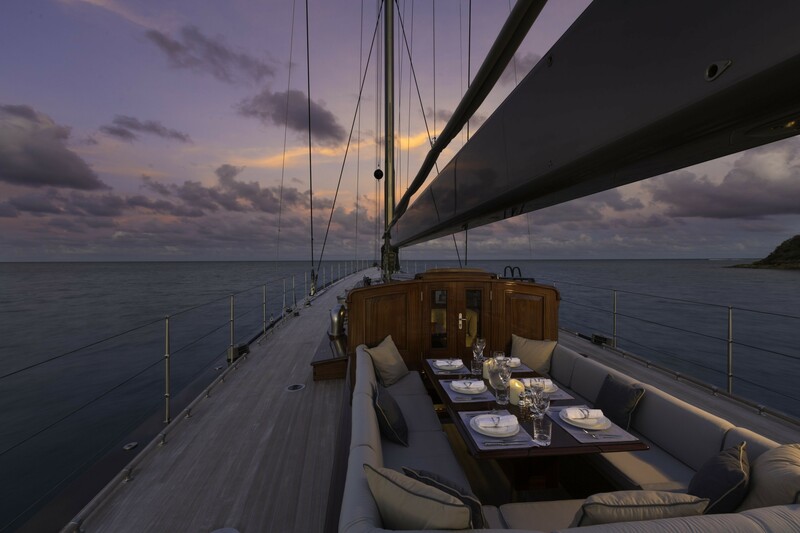 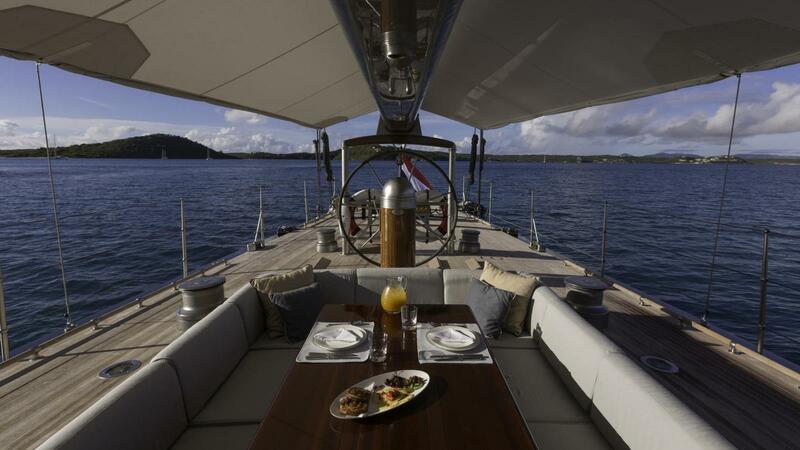 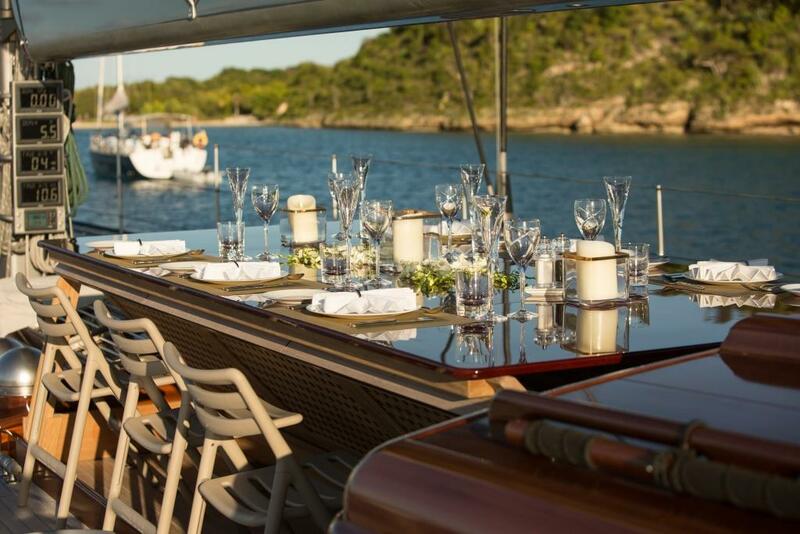 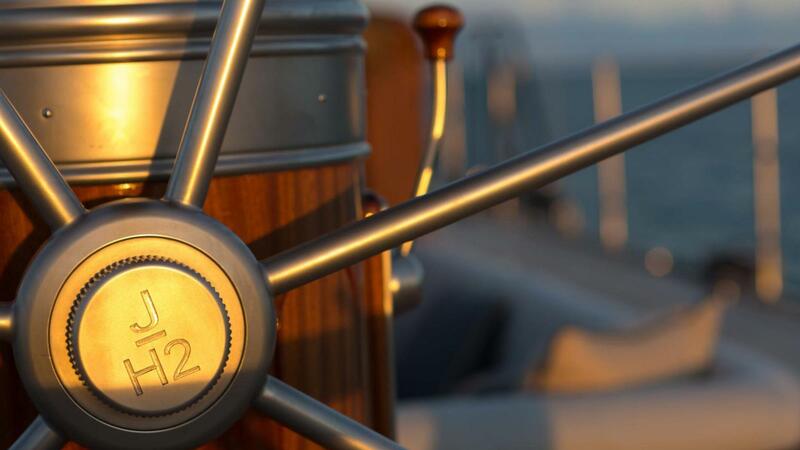 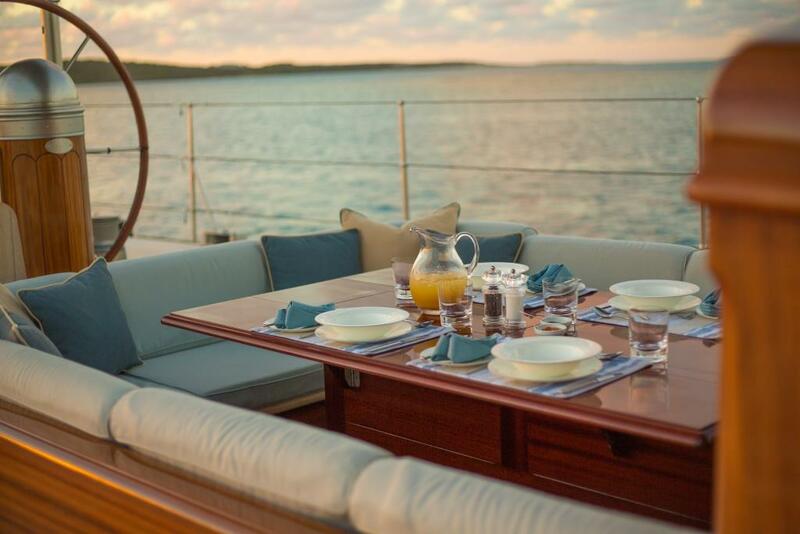 The sailing yacht Rainbow offers accommodation six guests and has a permanent crew of seven. 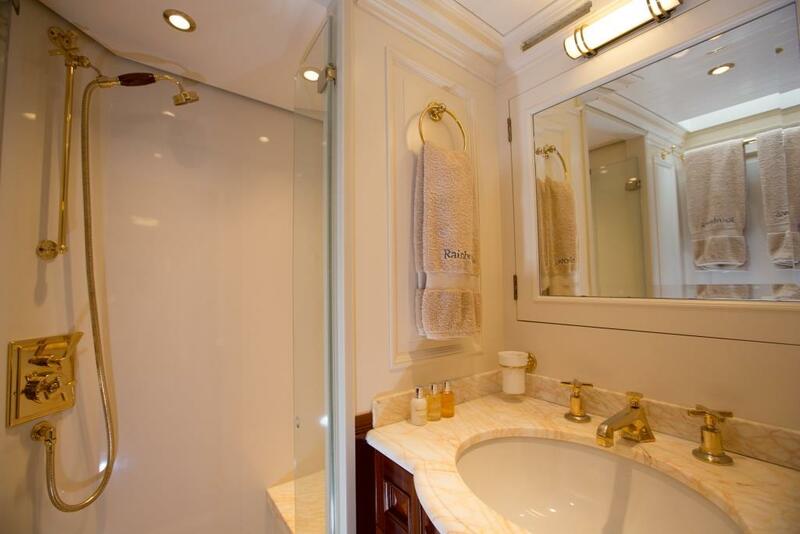 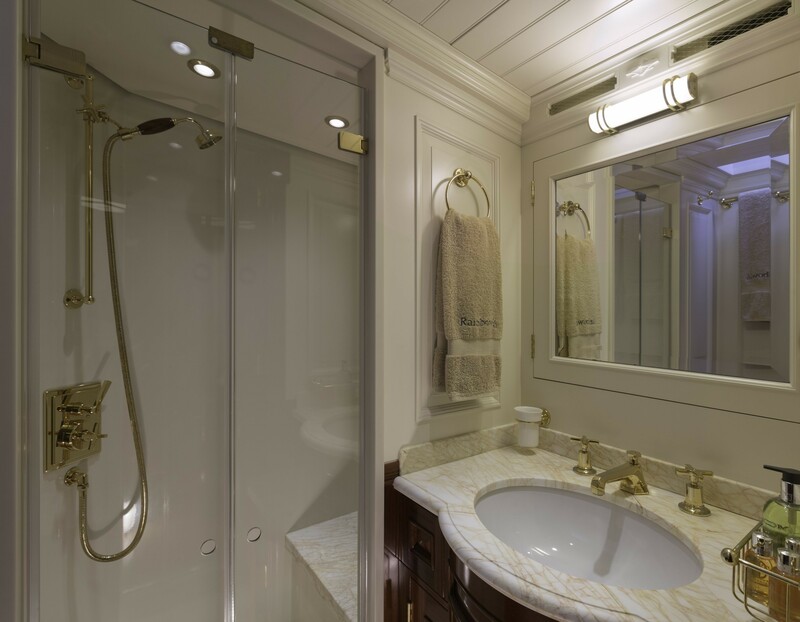 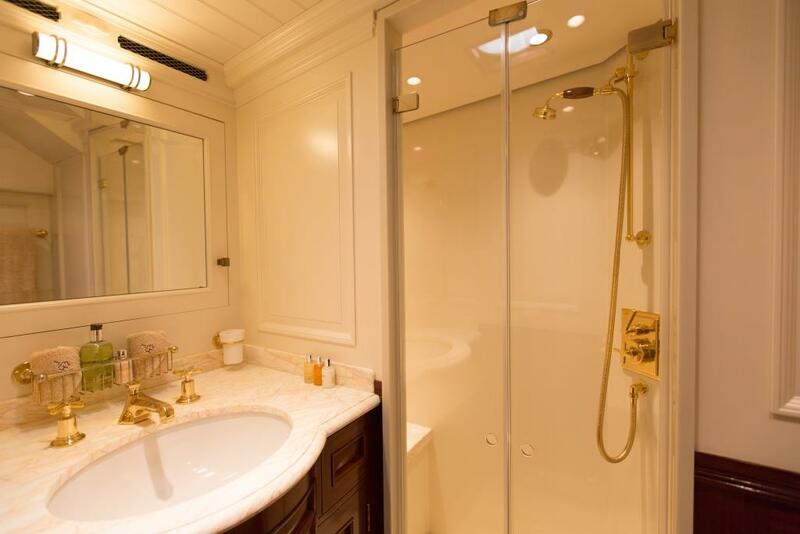 The owner’s stateroom is aft, and there are two ensuite twin guest cabins, each with a Pullman berth. 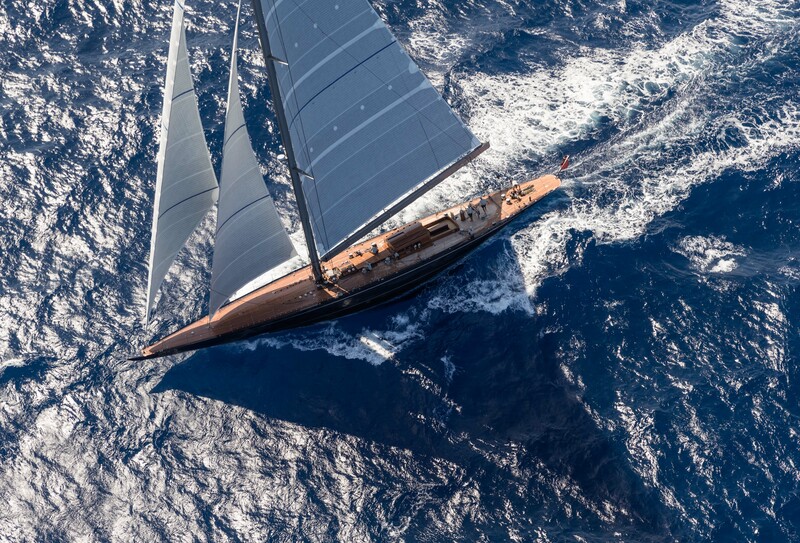 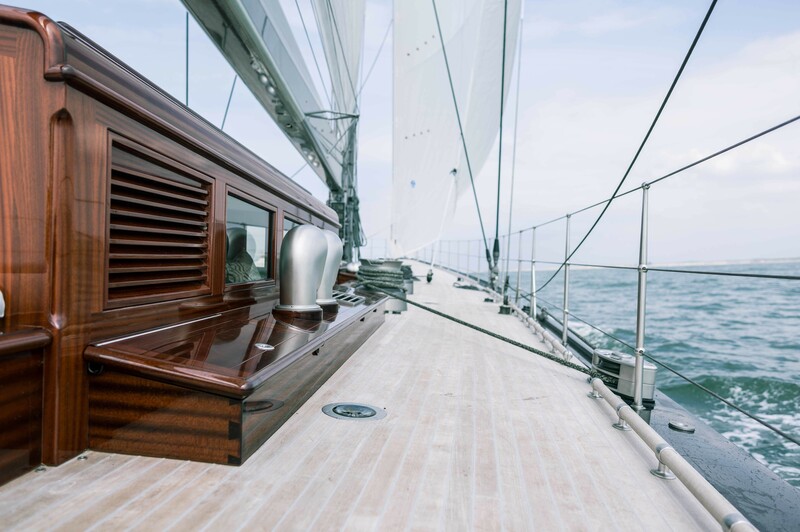 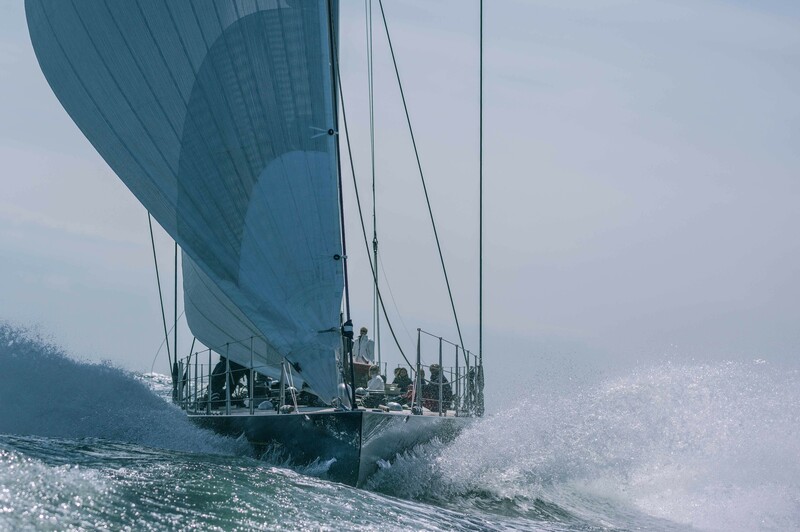 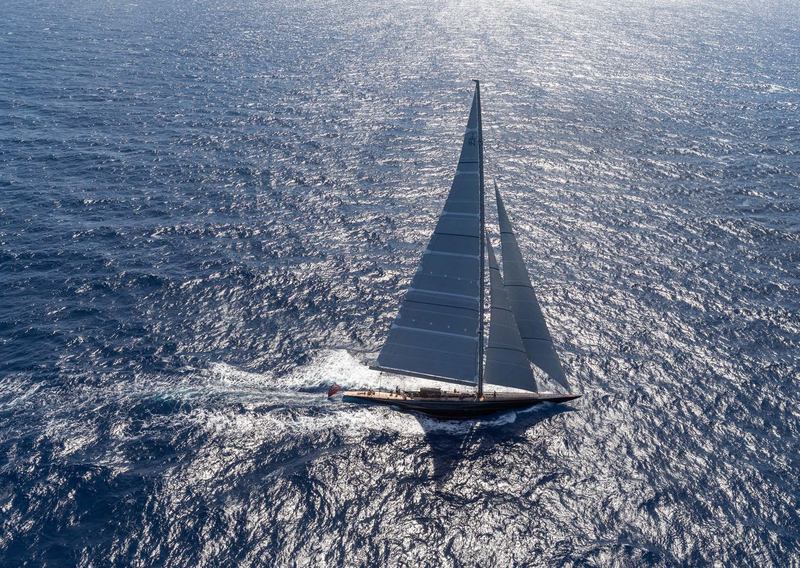 The spectacular 40-metre J-Class yacht RAINBOW features a unique hybrid propulsion and power system inside a racing boat hull, all topped off by a Grand Prix racing deck and rig. 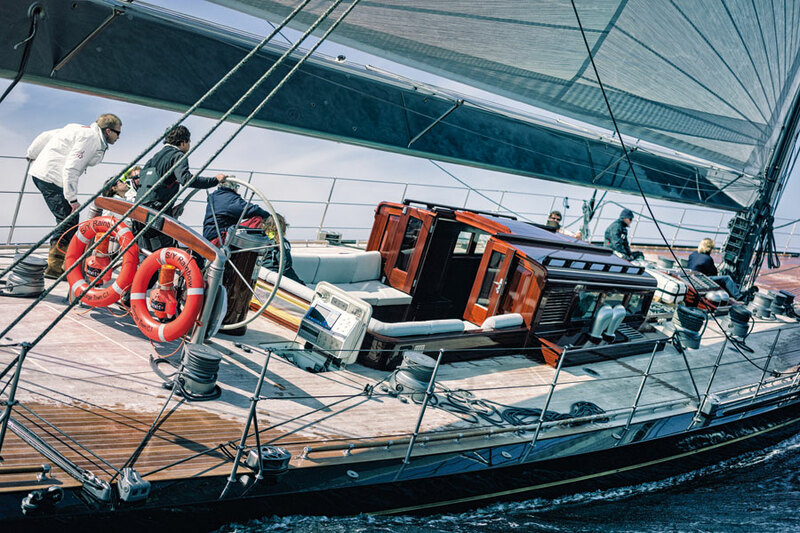 The rig includes a Southern Spars high-modulus carbon mast, boom and spinnaker pole, continuous carbon fibre rigging, North Sails 3Di racing sails and Lewmar high-speed hydraulic winches. 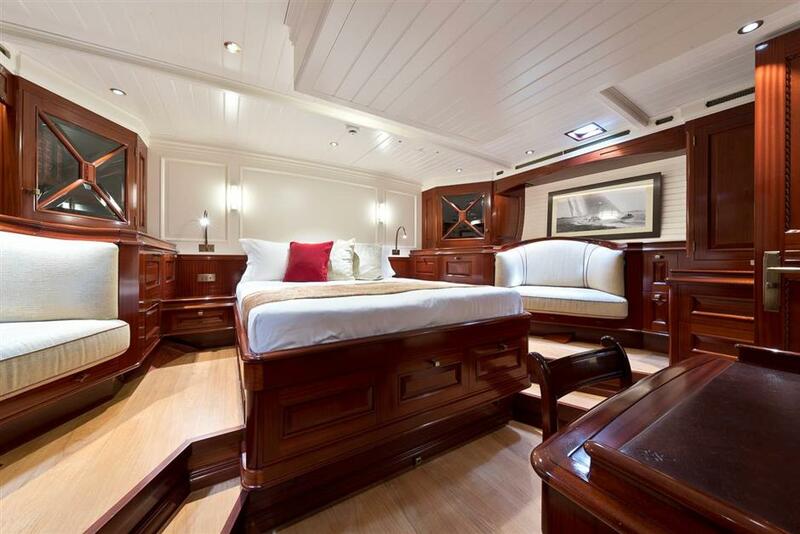 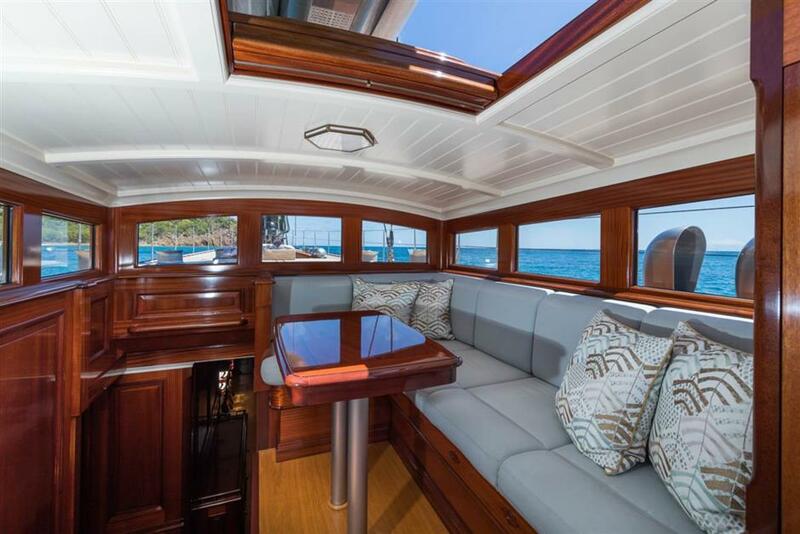 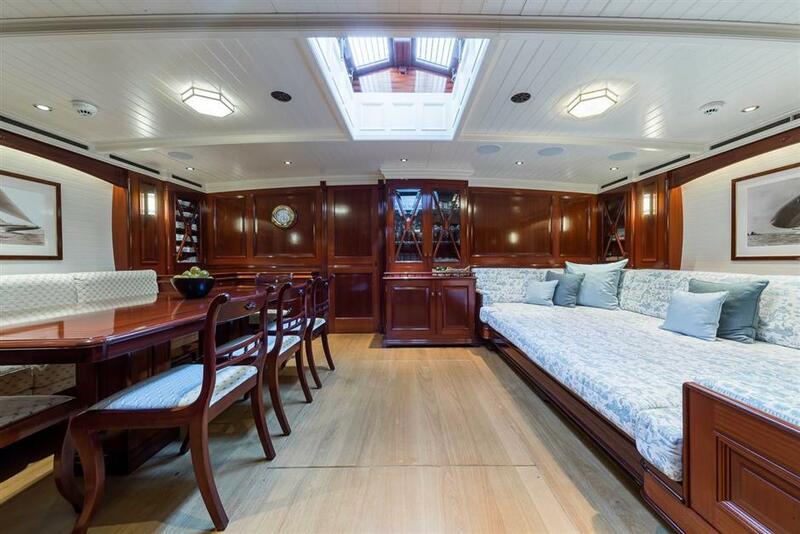 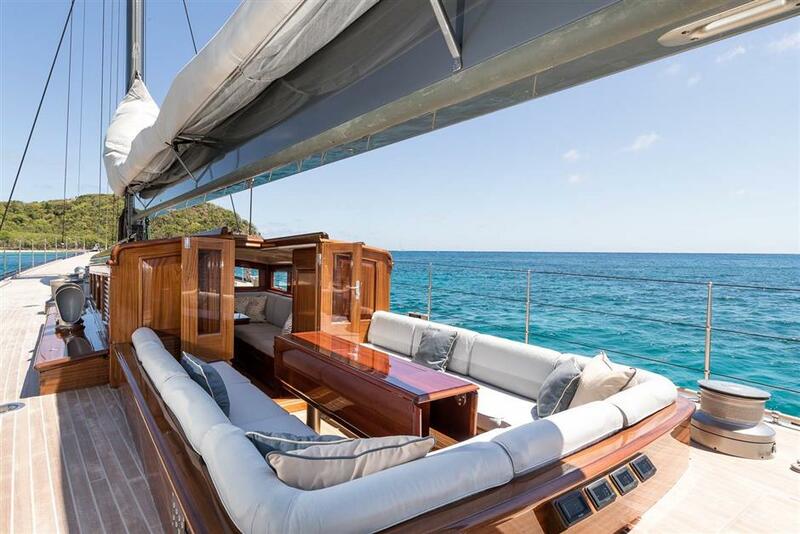 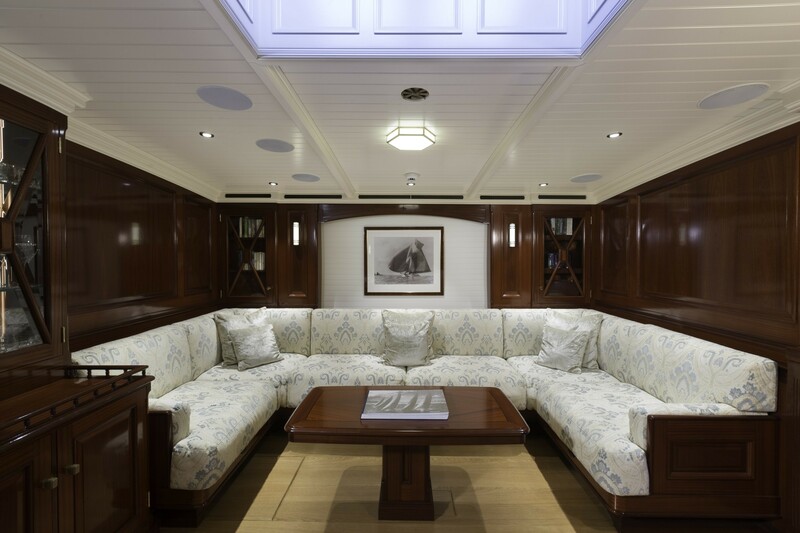 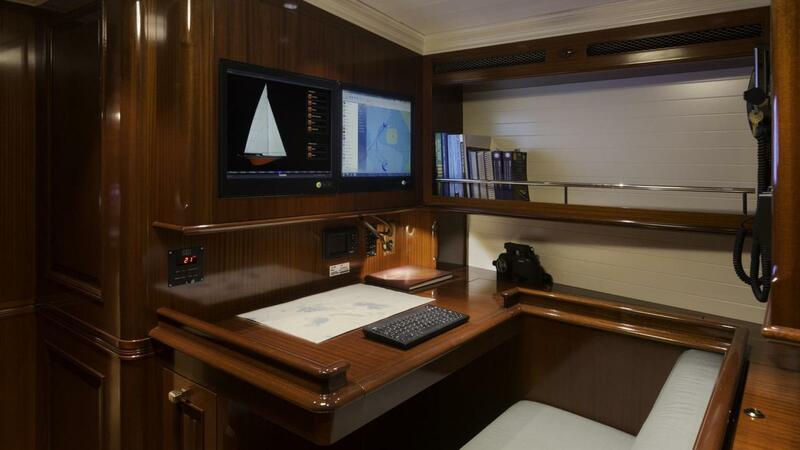 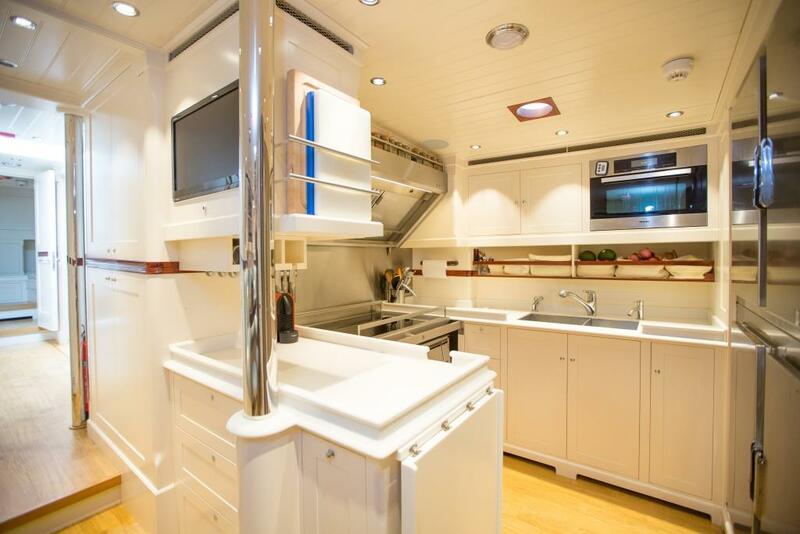 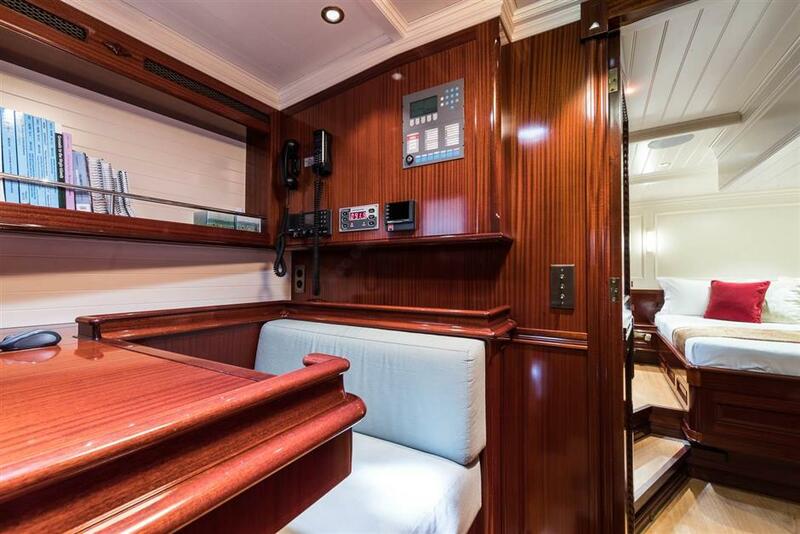 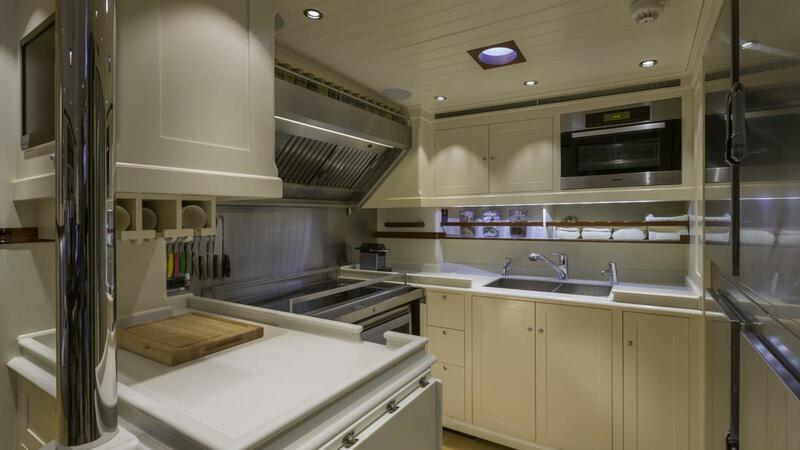 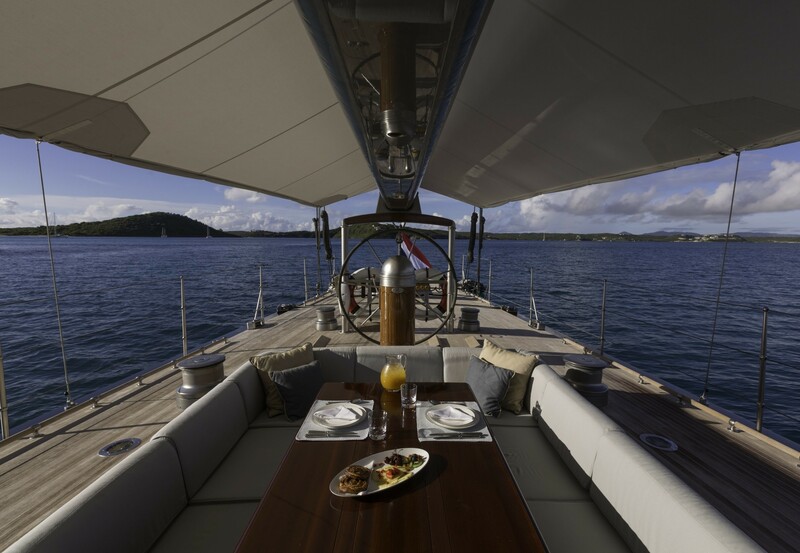 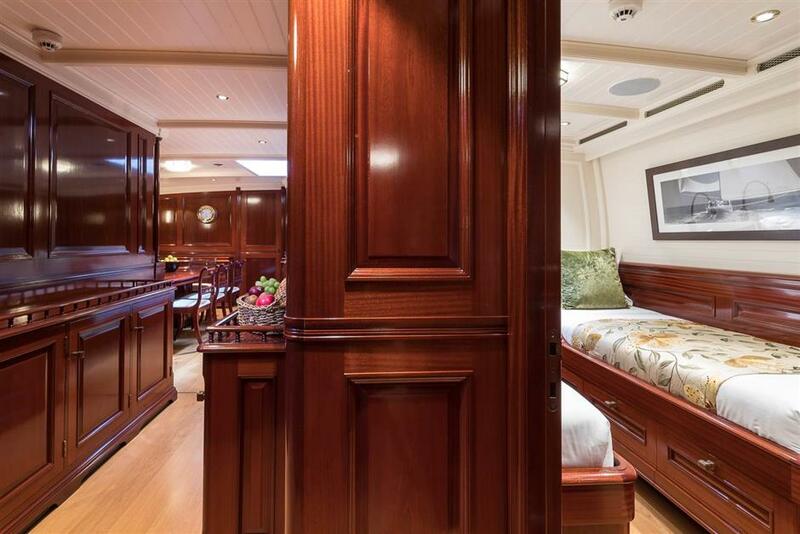 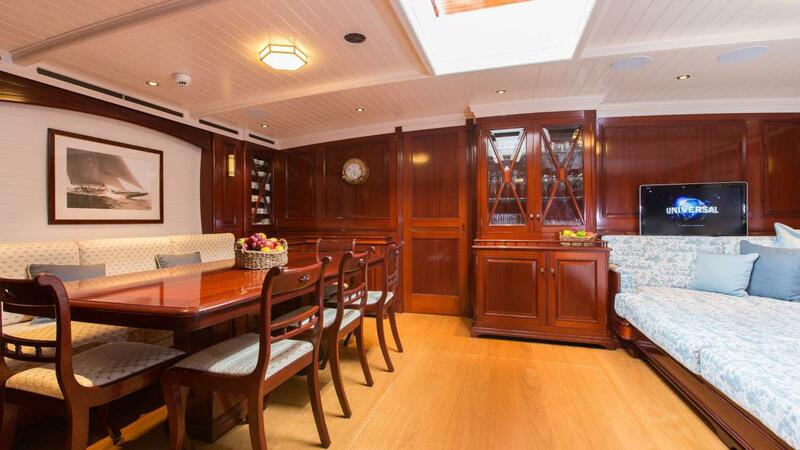 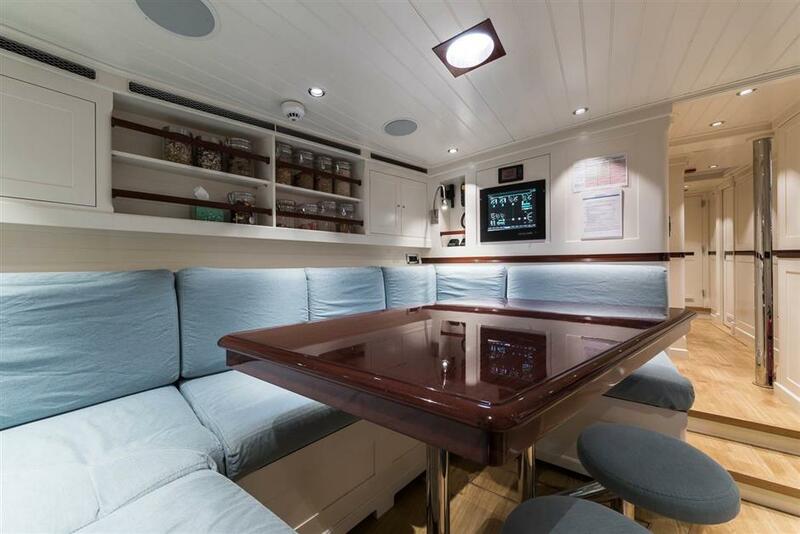 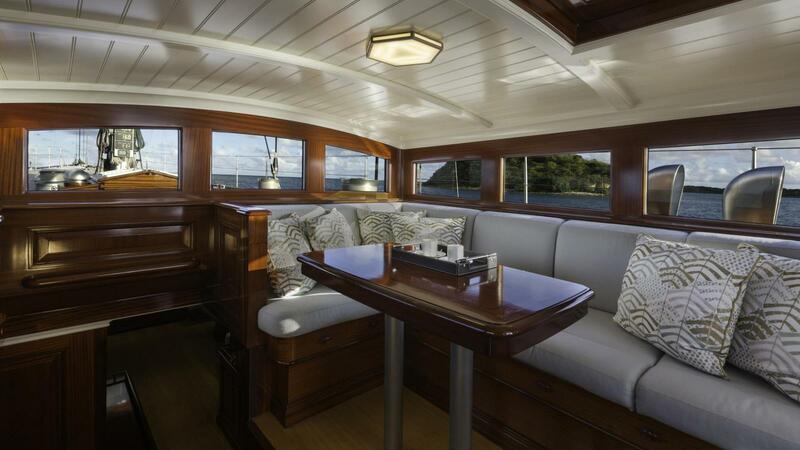 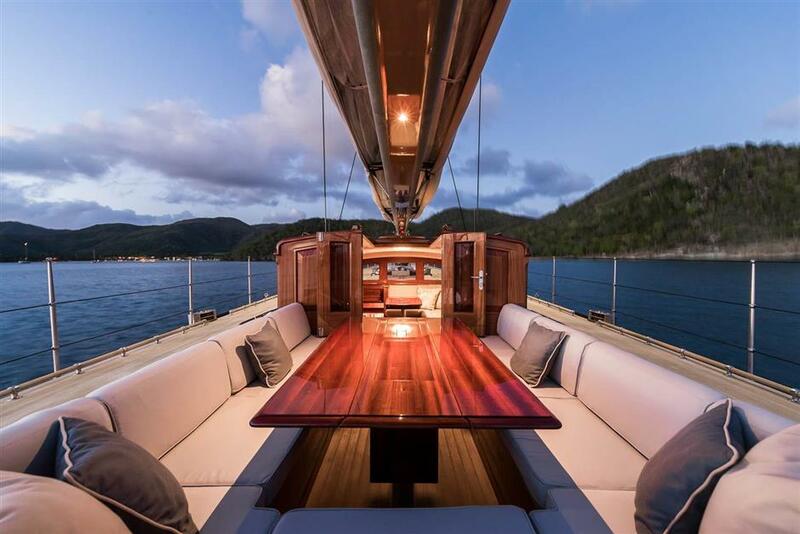 Modern functional requirements have been integrated into yacht RAINBOW’s design with full respect for RAINBOW’s heritage, while the decks have been kept as clean and flush as possible featuring only a mahogany doghouse and skylight. 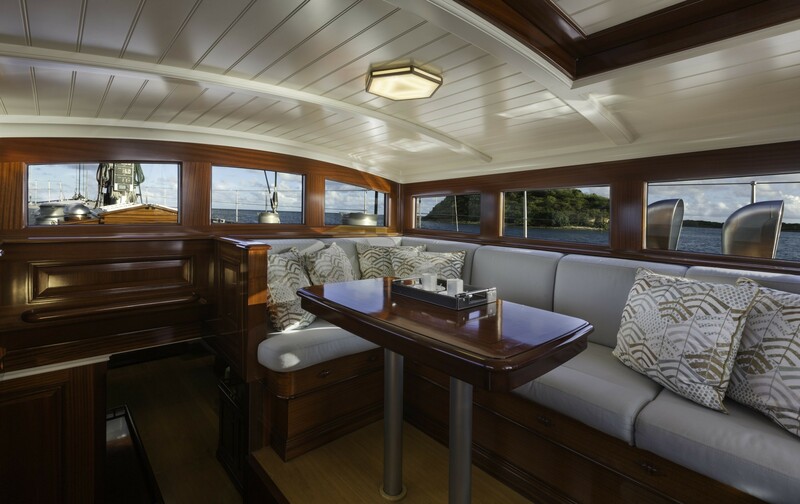 The skylight offers a quite spectacular contrast with the superb jet black-coloured hull and gold leaf cove stripe. 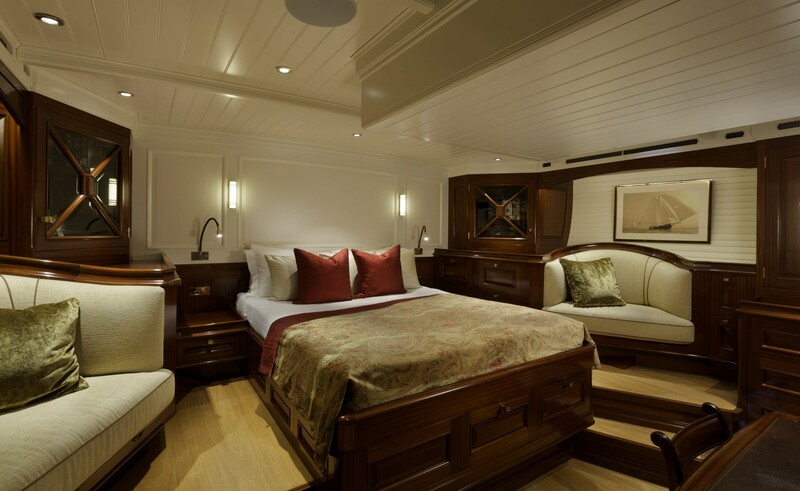 Accommodation is provided for a total of 8 guests. 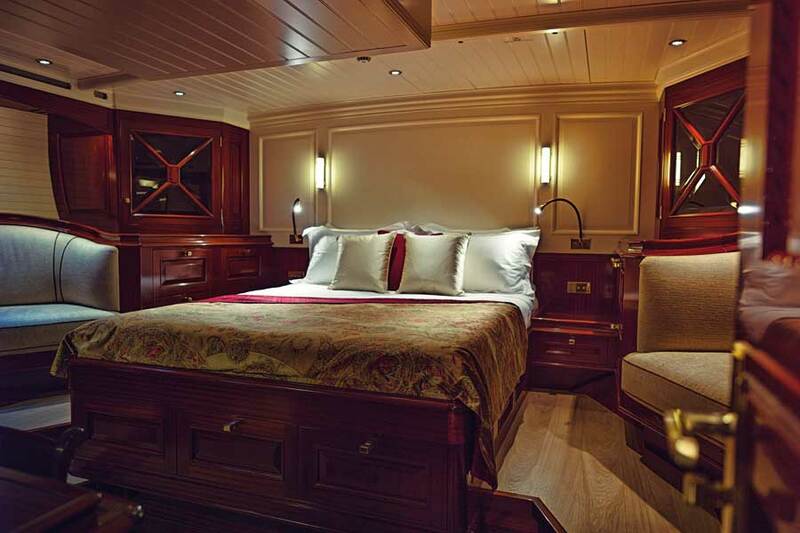 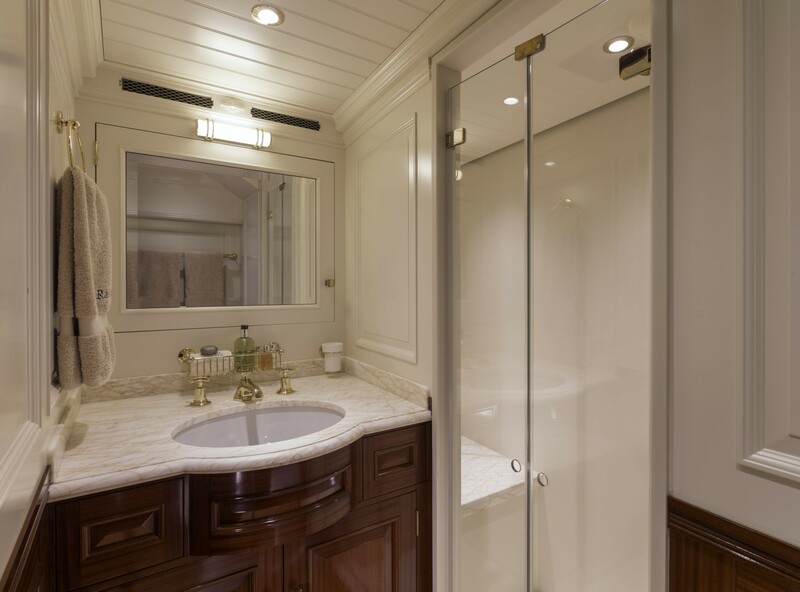 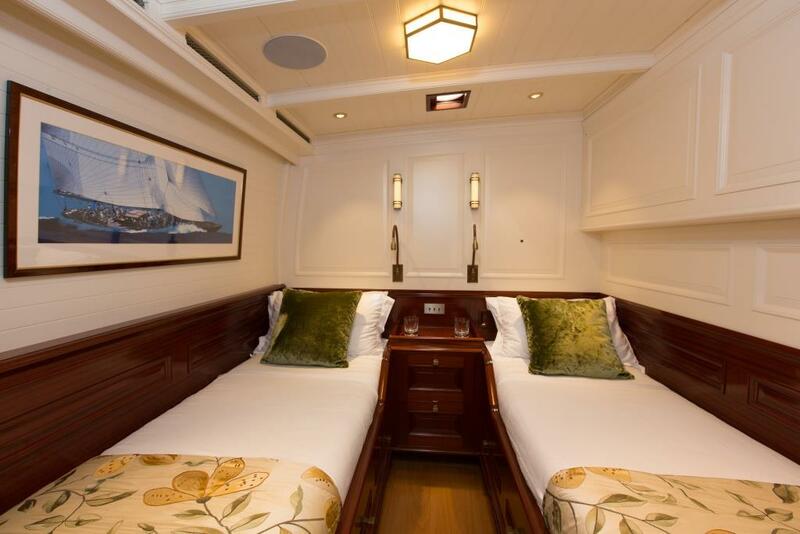 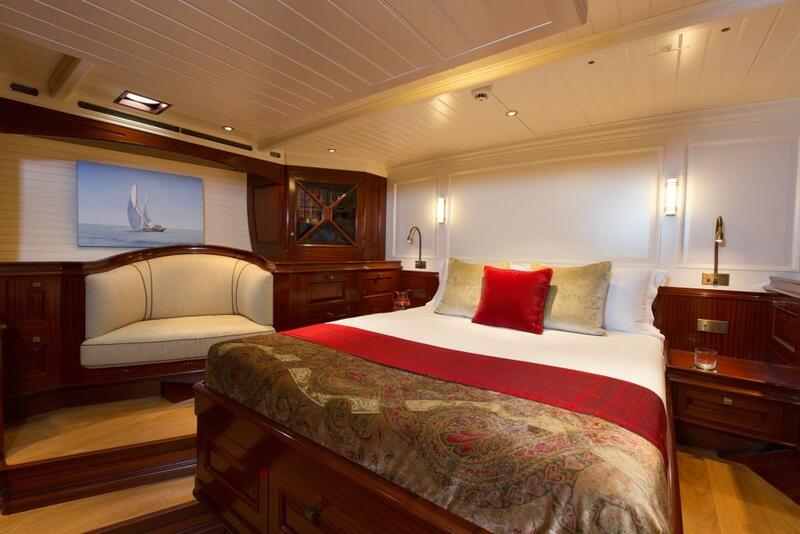 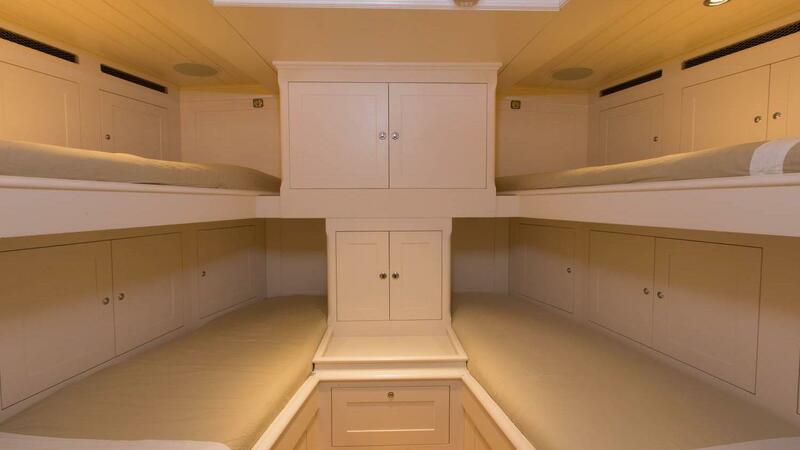 The master cabin features a double bed and an ensuite, while twin cabins have convertible beds, as well as ensuites.